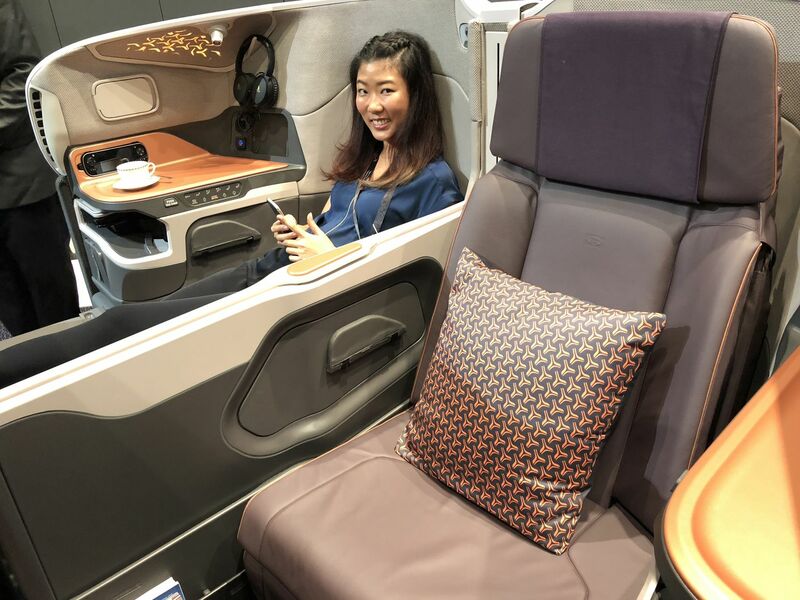 Spacious, well-appointed and boasting all the mods cons – this is easily Singapore Airlines' best ever business class seat. 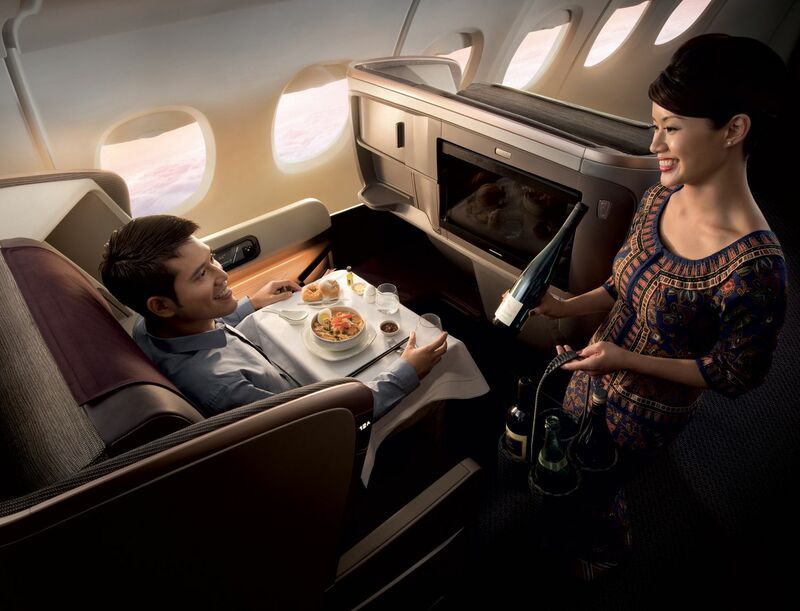 Take Singapore Airlines' already well-regarded Boeing 777 and Airbus A350 business class seat. 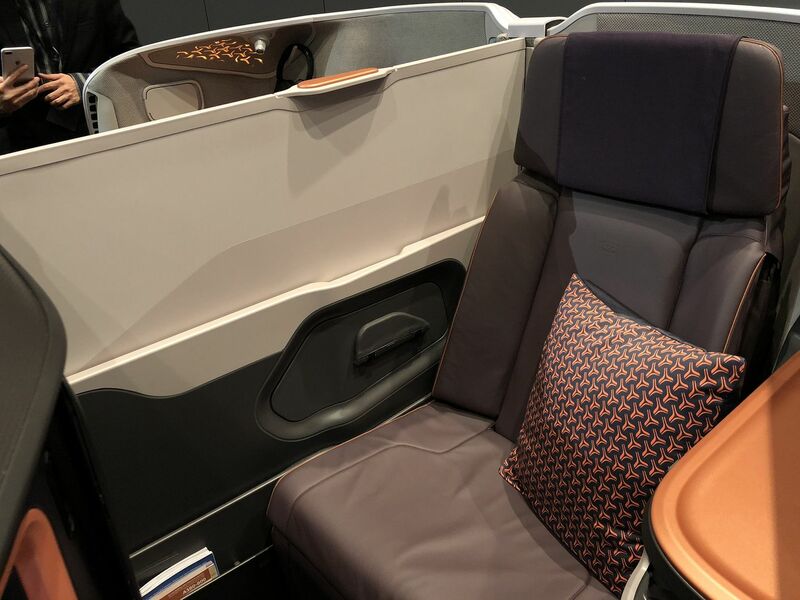 Ask the hotshots at JPA Design, who created both that seat and the airline's original superjumbo business class bench, to evolve the fundamentals of both products and bring to life a third generation of SQ's flagship business class. ... and then, well, grab a clean sheet of paper, invest three years of work and see if you come up with something like this. 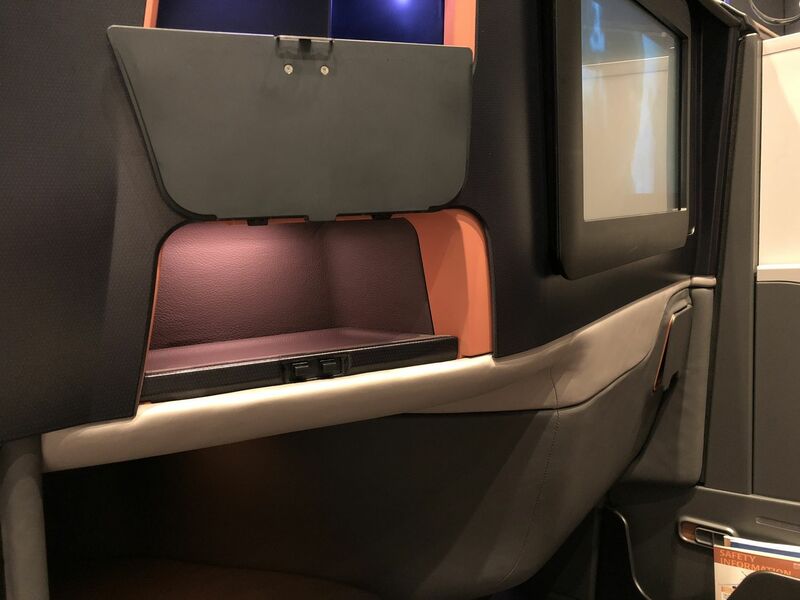 Fortunately, JPA Design did just that – and the result has got to be a contender for the title of world's best business class seat, going up against the likes of Qatar Airways' superb Qsuite. 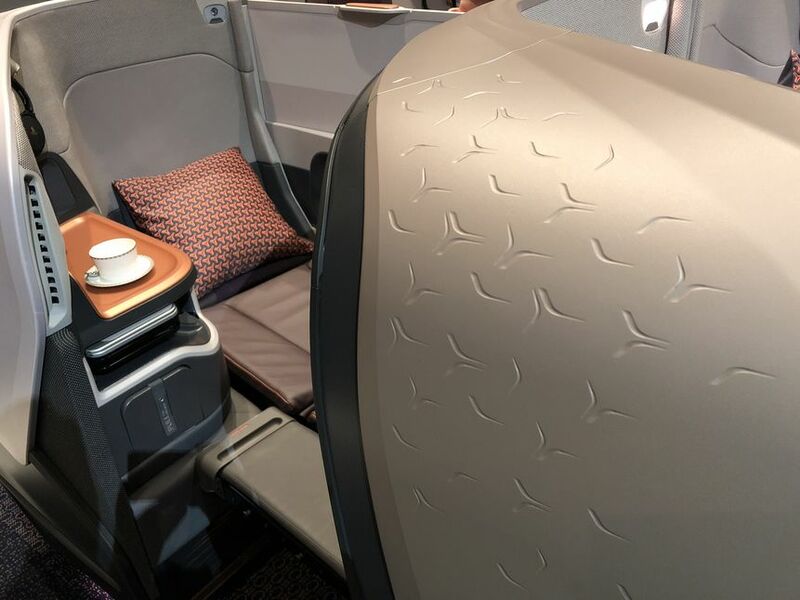 Here's an up-close look at the new wave of Singapore Airlines' Airbus A380 business class. The feature that's getting all the attention is of course the 'business class double bed', so let's start there. 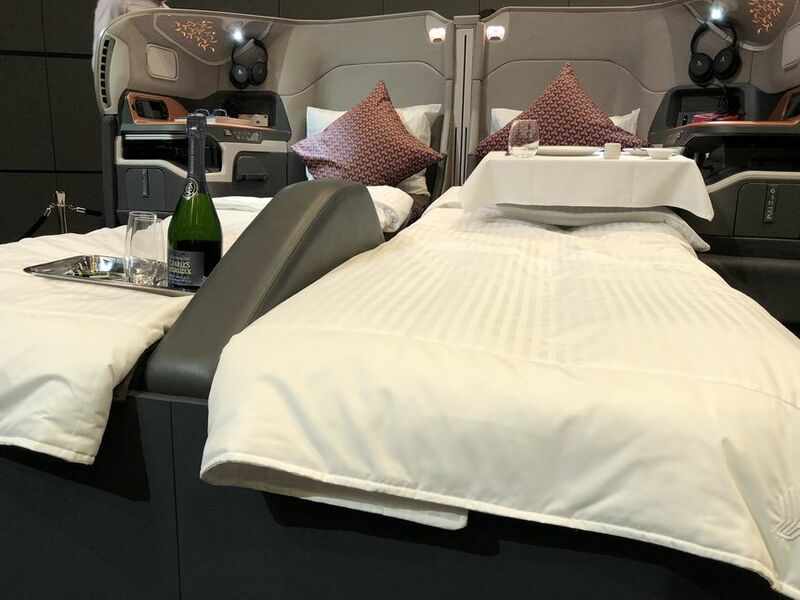 Of the superjumbo's 78 business class seats – which of course follow a 1-2-1 layout so that every passenger has direct access to the aisle – just six of these (or three pairs, to be more precise) can be converted into a double bed. These are the middle seats directly behind each of the business class cabin's three bulkhead rows: specifically 11D/F, 91D/F and 96D/F. The bed extends into a wide cubbyhole in the bulkhead, up to around mid-shin height on your legs, so you'll be less exposed than the press photo below implies. 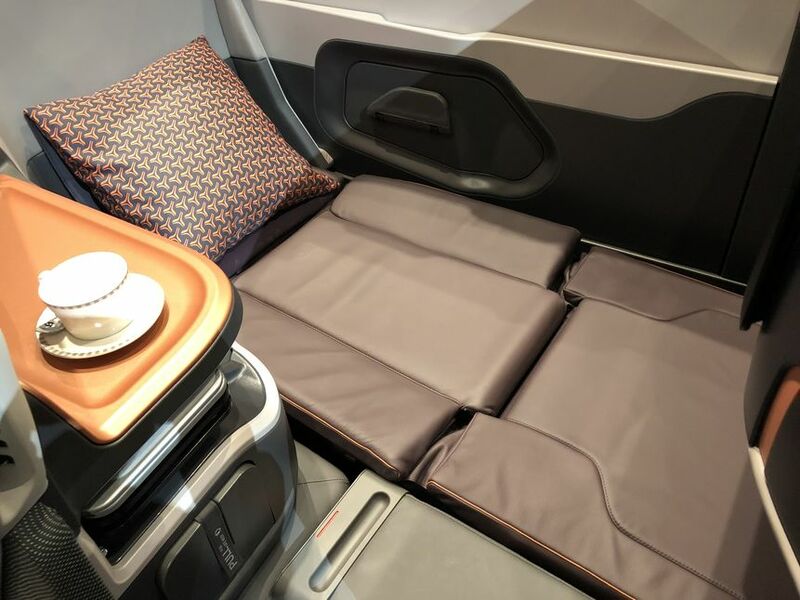 Our photos from the seat launch in Singapore show a dummy element to replicate the bulkhead 'monument' – although it's also clear that, like its first class counterpart, this arrangement is less a true double bed than two singles cosily nestled side-by-side. The sleeping arrangements for the other business class passengers are less adventurous. ... and if you're really friendly with one another, fully retracted into the seat shell. The seat reclines into a fully-flat bed, but with an angled sleeping position. Some travellers will find this quite comfortable becasuse you can sleep on your back or your side, while others will intensely dislike lying on an angle. ... to give you a bed that's 78 inches (1.98 metres) long, with the same 25 inch (64cm) width as the seat itself. Visible in the photo above is the recessed surface of the console between the passenger and the aisle. 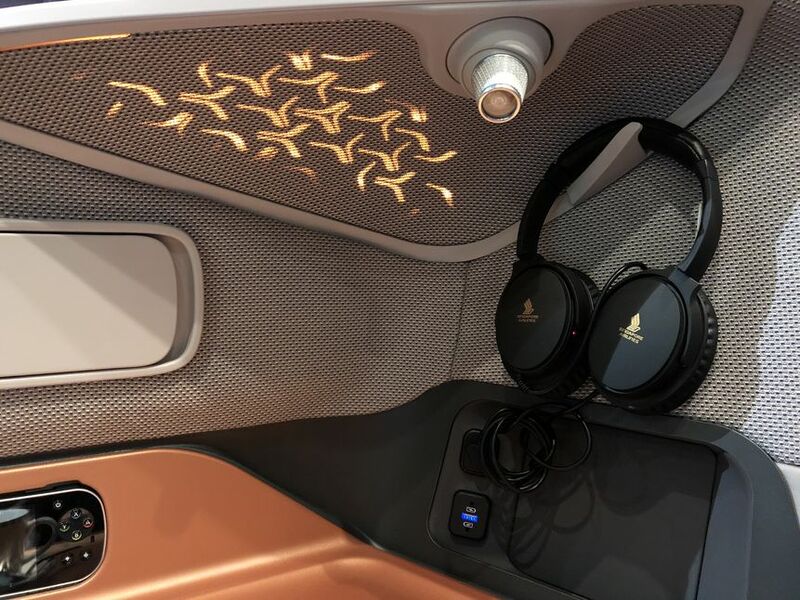 The console includes the seat controls and inflight entertainment controller, while above it sits a convenient LED-illuminated mirror. 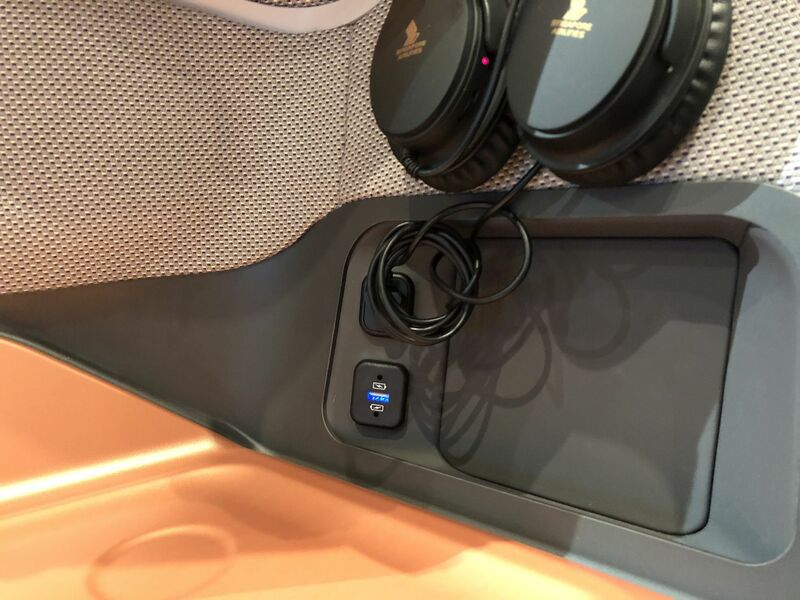 Further back from this panel dangles a pair of noise-cancelling headphones and a high-power USB socket. Here's where you can start to notice some of JPA Design's attention to detail. The material surrounding the seat is softly padded, which gives it a warm natural feel as well as absorbing and thus reducing sound. Directly above this corner and built into the seat's inner shell is this backlit 'flying delta' detail. 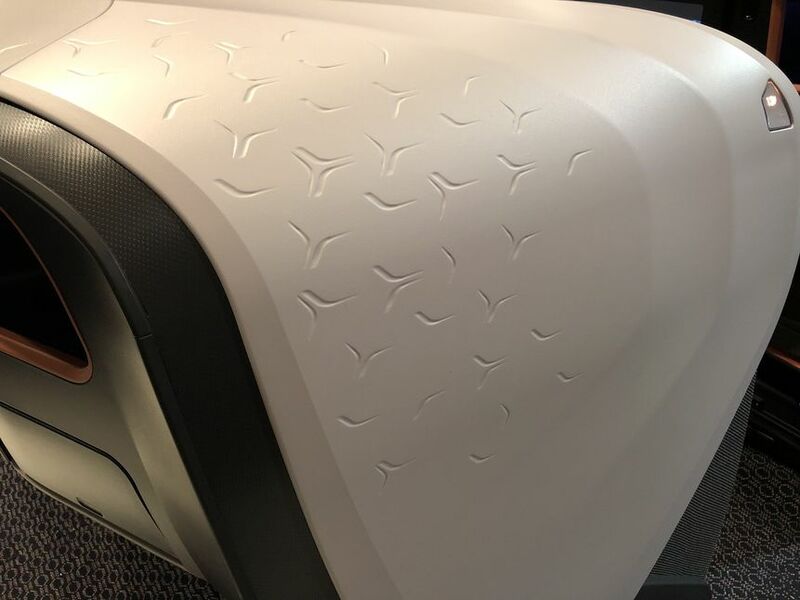 It's a subtle highlight which gives the seat some character, and is repeated on the seat pillow as well as outer shell. That shell is made from a single piece of moulded carbon fibre composite – the same lightweight but robust material now being used in advanced aircraft such as the Airbus A350 and Boeing 787 – and which gave the seat its design codename of Monocoque, in reference to its 'one-body construction method'. 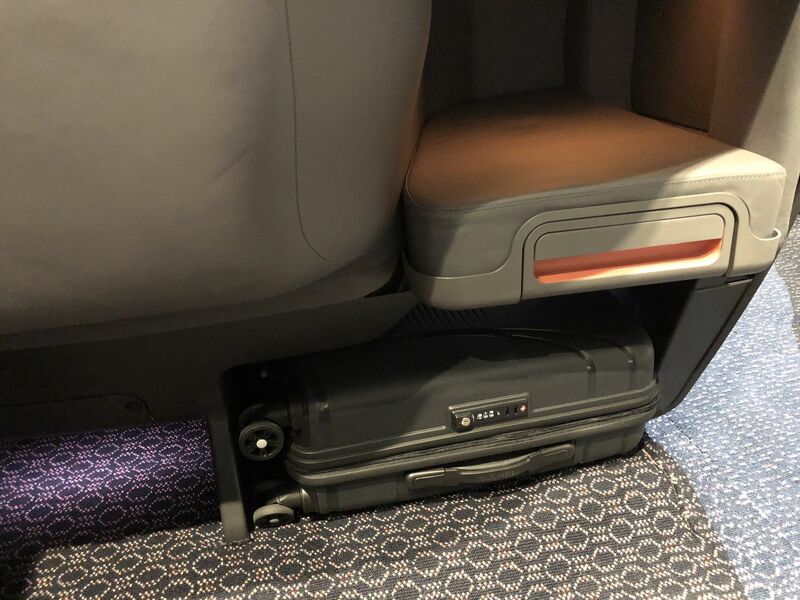 Eschewing the need for a metal base as its primary support, the streamlined shell allows sufficient room under the seat for a standard cabin bag as well as a laptop bag or handbag. 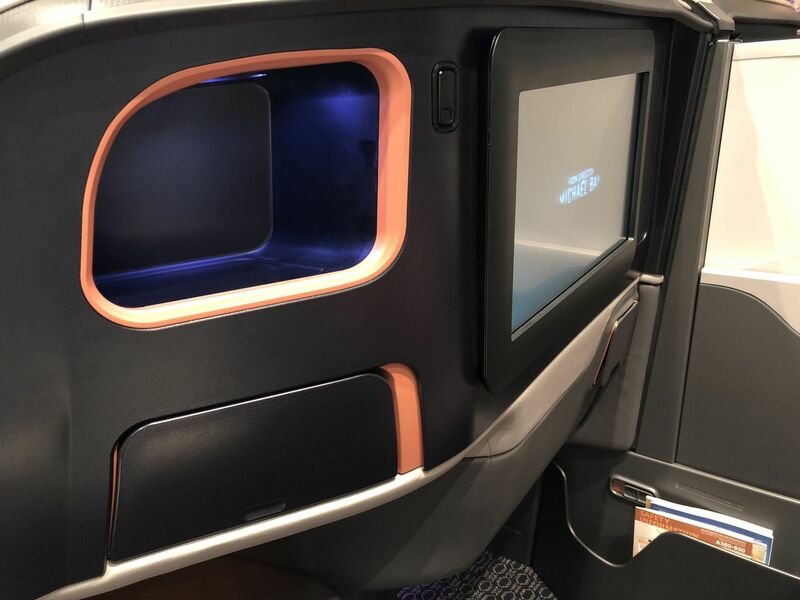 Next to the monitor are two stowage cubbies: one open for easy access at any time during your flight, and the second with a hinged door. 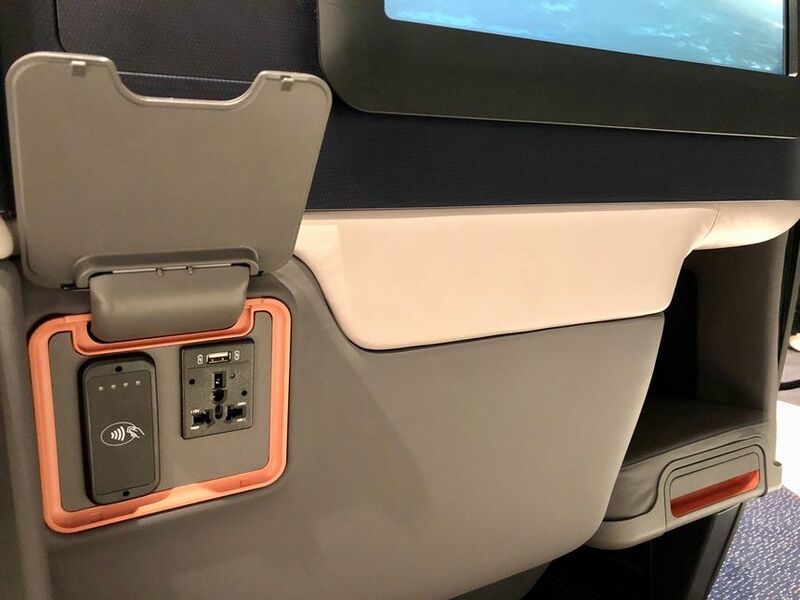 Further down, another flap reveals AC and USB ports (bringing the tally to two USB sockets per passenger) and an NFC reader which can be used to purchase inflight Internet with a tap of your credit card. 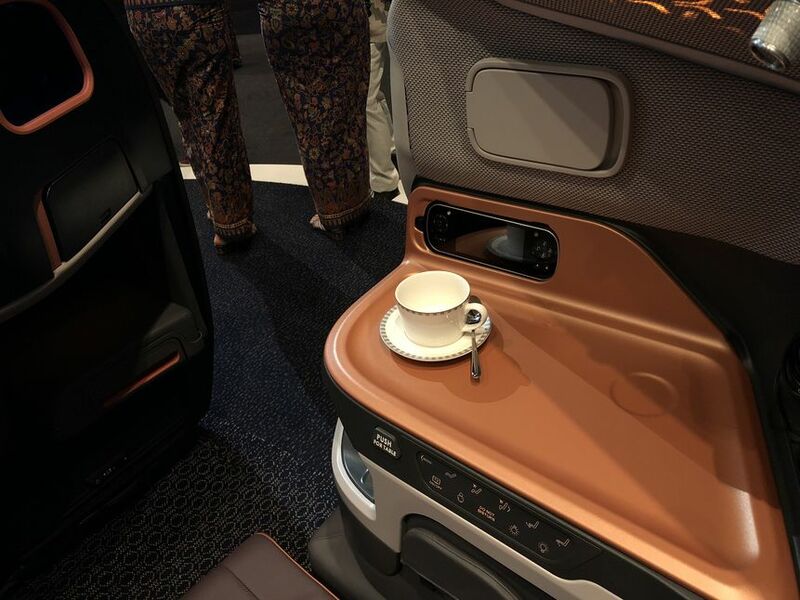 All in all, this adds up to an excellent business class seat and one which we can't wait to fly. We expect that almost every business traveller will feel the same way. 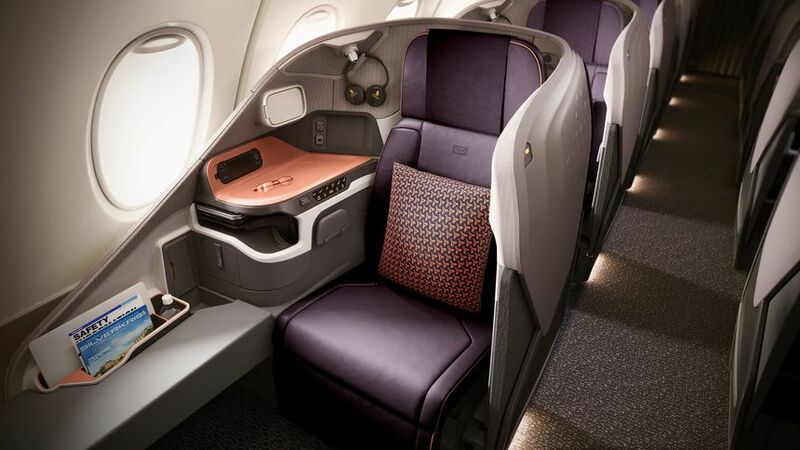 Singapore Airlines will begin flying its new business class seats daily on the Airbus A380 between Singapore and Sydney (SQ221/SQ232) from December 18 2017, with selected Singapore-London services tipped to follow from March 2018. David Flynn travelled to Singapore as a guest of Singapore Airlines. 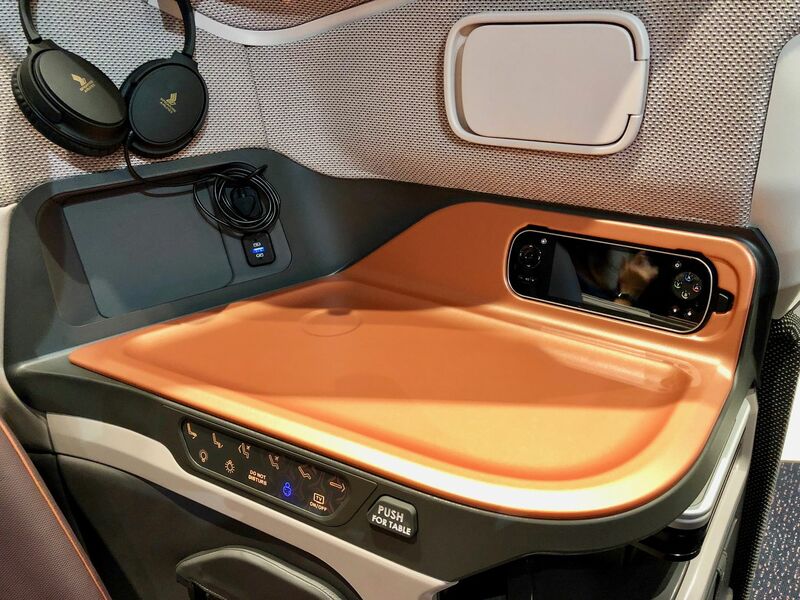 How does the feet cubby hole size compare to the current A350 J seat? Makes you wonder if QF need to revisit their decision about upgrading their A380s with the Business Suite from the A330/787s. 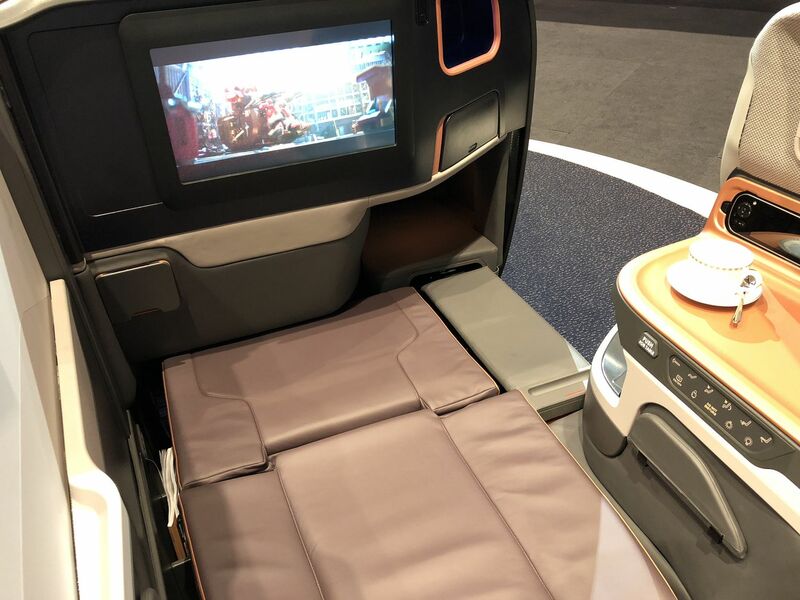 This new SQ seat eclipses the QF seat; in 2 years time the QF seat will look very "last generation" and that is when QF are starting the rollout. Interesting thing from the photo is it looks like they've taken out the side storage bins. Maybe they're not used enough/weight saving? What a disappointment. Its all downhill from a generous 30 inches width to 28 and now down to 25. Also the seat pitch has gone from 55 inches to 50 - and the "foot" hole looks even less in the new seat. So what was supposed to be an improvement is definitely a step back towards the very old and narrow business class seats. 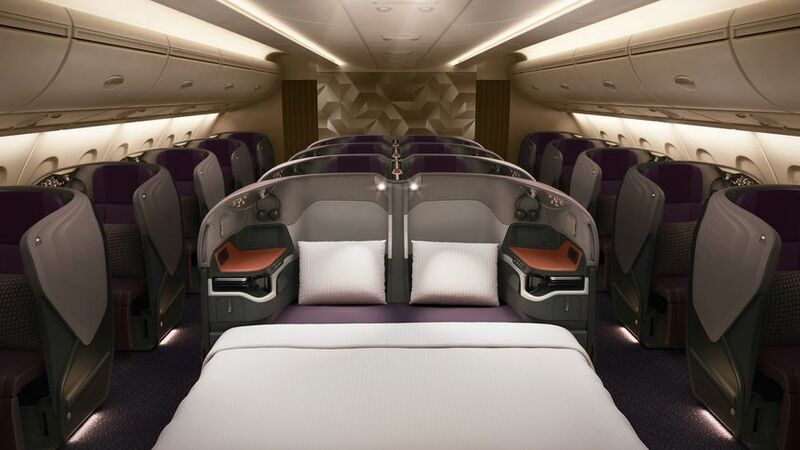 Gone are Singapore Airlines superior Business Class cabin. Are they providing some sort of foam mattress or are they keeping with the sleeping on a park bench feeling? It looks fantastic, but I'm not sure they have thought it all through. I for one would hate to be in one of the "double bed" seats - zero privacy! SIA have taken a great seat and made it worse. No elbow room, and a bit too coffin like. I’m sorry David, with all due respect, I don’t agree that this even comes close to Qatar’s QSuites, never mind going “toe to toe”. The problem with these seats, and there predecessors is the small cubbyhole space for your feet when sleeping. It makes for an unnatural sleeping position. 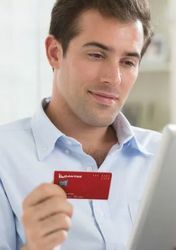 I read with interest all the diverging opinions about the SQ premium classes upgrade. 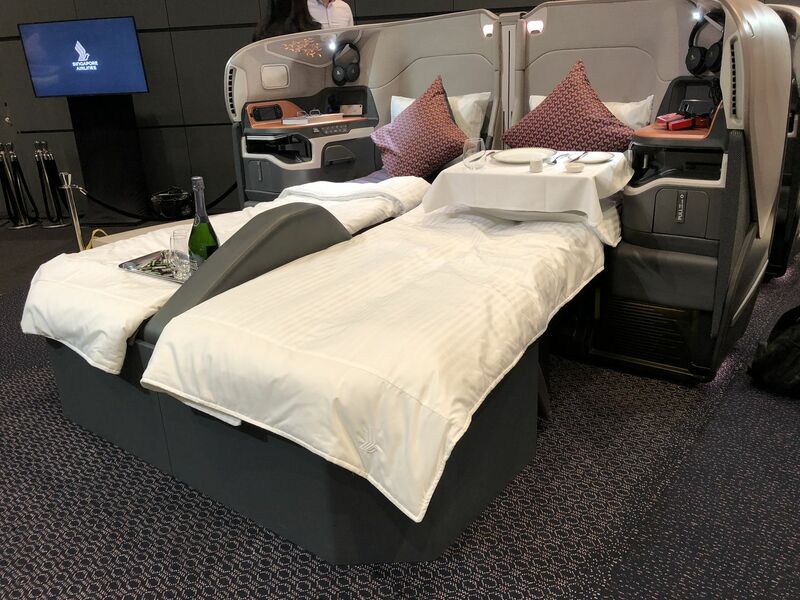 All I can say having flown Business SIN/AKL on the 777-300 earlier this year was that they were the widest Business Class seats that I have experienced with Air New Zealand, Air Tahiti Nui,Air France, KLM et al, but I did not like laying sideways to sleep. Length is okay but angle is everything as a girlfriend used to say! Could someone please answer chriss0's importantb question about whether a 'mattress topper' will be available? 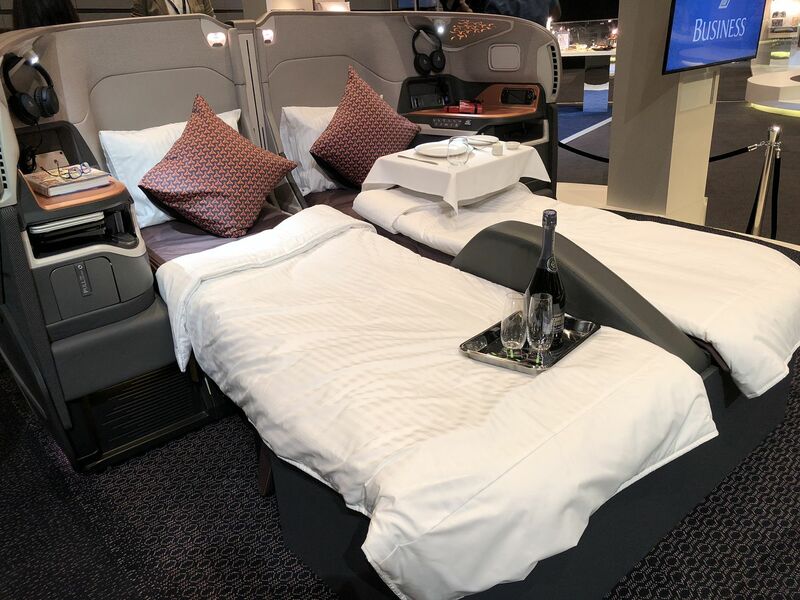 I too don't like a lot of airline business class 'beds' as it's sub par compared with a railway sleeping berth, where one generally has proper linen. There's something a bit grotty about just sleeping on a seat. I agree that tucking one's legs at an angle when trying to sleep is unnatural. Taller gents (and ladies) may find this particularly difficult. One wonders whether the designer (and SA senior staff) tried this out in a mock up. Great photos though David, in what must be a challenging environment to photograph with people wanting to walk past all the time as they inspect the aircraft. Oh dear. I was hoping to be amazed. Their current Business seat is everyone else's First Class seat. 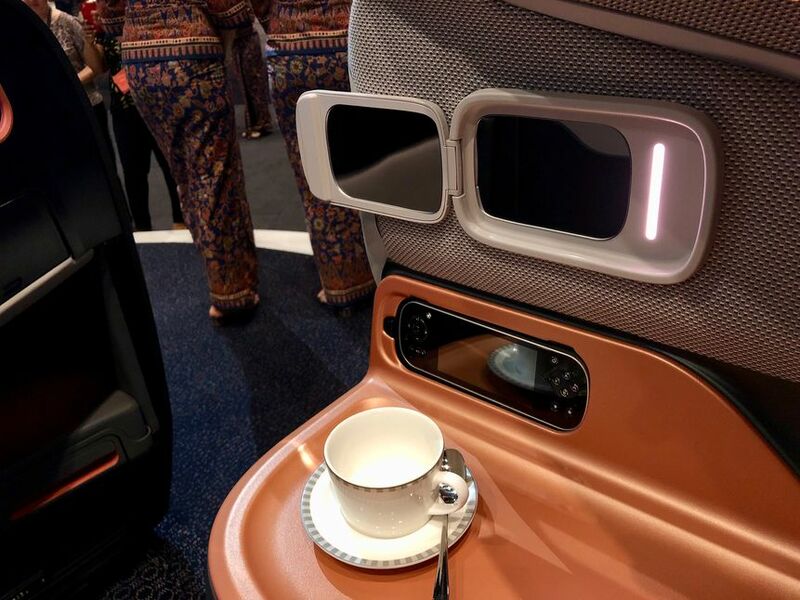 The new Business seat is just another seat-in-a-shell. I loved the proper mattress rather than a lumpy seat with cracks and bends in it. Apart from the cubby hole my biggest downside are that they've pretty much covered up the windows. If they’ve fixed the lack of legroom for taller folks all good. Otherwise, ho-hum. I’m 6’4” and the existing seats are really cramped, plenty of width but no pitch. I’ve just gotten off an SQ flight with the current business seats and have to say they are some of the most uncomfortable seats in the industry. So wide you need to use pillows as armrests and the whole idea of having to get up to flip the backrest over to become the bed doesn’t really do it for me either. 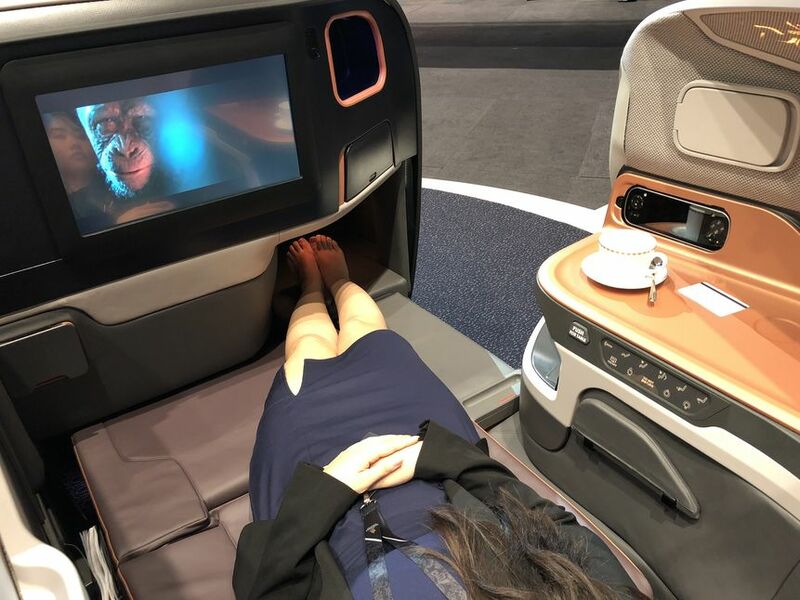 According to a video review posted on YouTube by blogger, Sam Chui, business class passengers will be provided with a mattress topper, doon a/blanket etc which should make the experience all the more comfortable. Excited to try this out in January on SQ232. Sorry SQ. Far from impressed. Please get rid of the forced angle for sleep. 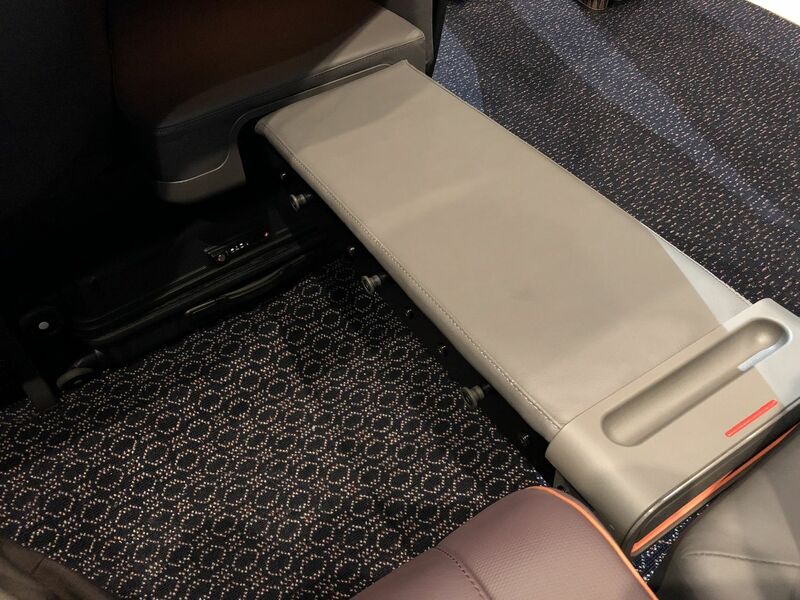 Why cant they just stagger the seats like everyone else so there is a straight sleeping position for us who are over 6 feet tall. Also I do hope that they do have a mattress topper. Dare I say it, the QF Skybed 2 is far more comfortable than the current SQ offering. SQ are still flying the 777-300er with the old configuration and the A380s are due to be converted by 2020. SQ is potentially cutting services 1st services to Aus from April 2018, so based on SQs past performance other potential better products from other airlines are being released soon and will be available for all of Aus not just Sydney. 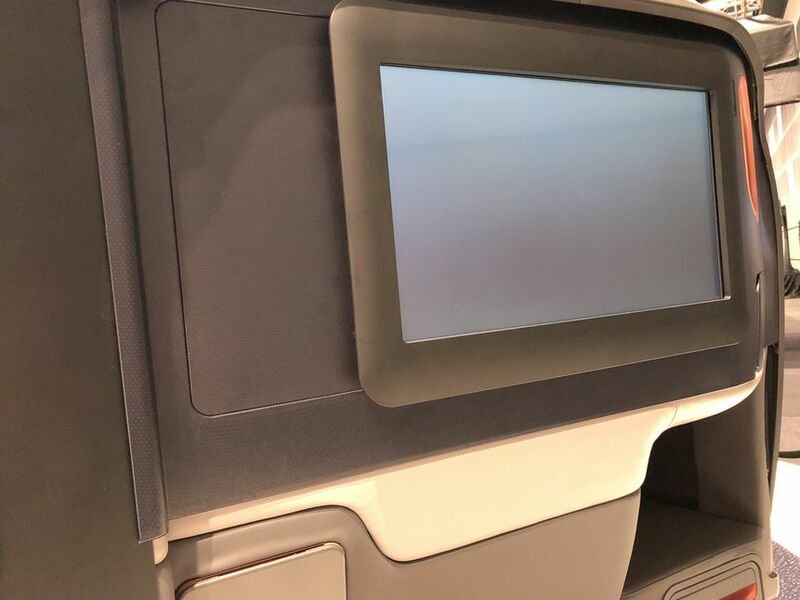 Seats 14A/K, 15A/K and 19A/K on CX's 35G each has a misaligned window. Generally speaking, quality of meals in C are fairly sub-standard and peculiarly (or perhaps conveniently?) similar to meals offered by W. No slippers on board, not even in F.
Due to unsensible and widespread cost-cutting strategies, 35G's seats were badly and irresponsibly made, and had to be re-retrofitted after only a few months in service - just for the sake of increasing operational cost. CC's attitude as a whole improved slightly since CX first announced its profit decline. 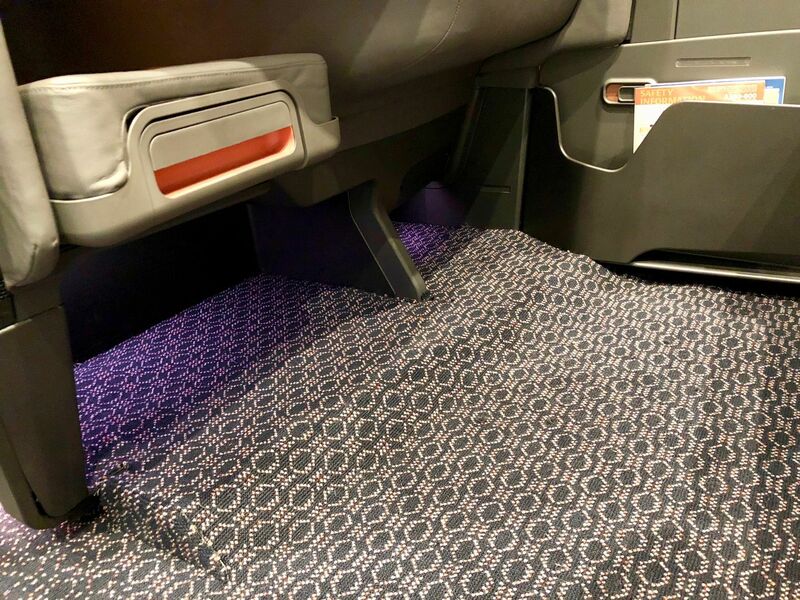 Lastly, I am not a big fan of reverse herringbone seats. I firmly believe only profit driven and ungenerous airlines are crazy about them (non-straightforward-facing seat configurations). After Cathay's most middle and top management personnels are replaced, improvements are sadly insignificant. Just about all aspects of CX's complete service standards are inferior to that of the SQ's. Yet in the current day and age, SQ is struggling to make a profit, thus there's no immediate reason for CX to perform any better. can't wait to try this new seat. Love the SQ J product. finally confirmed for 30th Dec in J and will have the bulkhead seat with our infant son in a bassinet. such a huge improvement on the old wide and hard business class offering. Those wide seats were horrible, didn't recline enough and had those silly cushions to make the seat narrower. Well done SQ a big improvement. 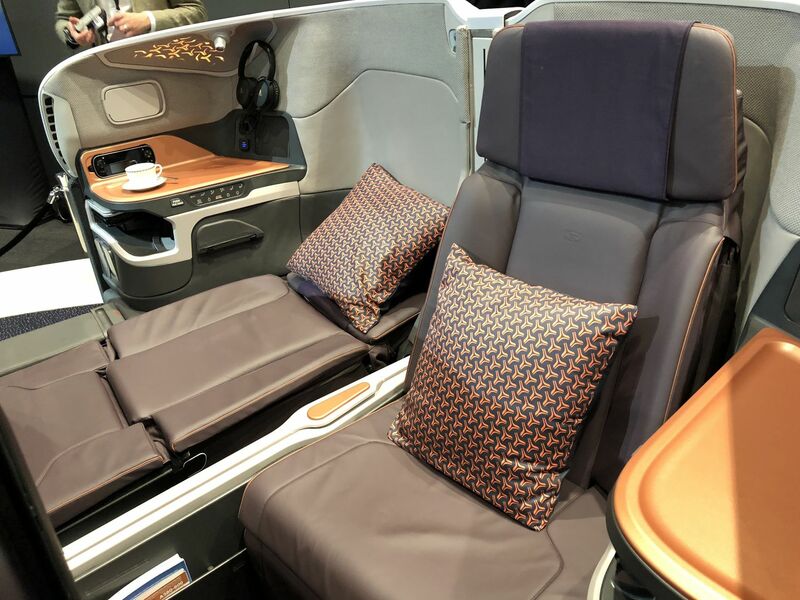 Comment on "Preview: Singapore Airlines' new Airbus A380 business class"